Ice Climbing Season: Mid July -> Late September. The best way of getting around is to buy the Bogong Alpine Area Outdoor Leisure Map by Vicmap. From Melbourne head north on the Hume then turn east onto the Ovens Highway and drive to Bright. From Bright head over the hill in the direction of Mt Beauty via the Bright Tawonga Road. About 27km from Bright you will reach a T intersection at the bottom of a big hill. Turn left away from Mt Beauty and drive for a few kilometres down this road then turn right into Mountain Creek Road. Follow this for about 12 kilometres (it turns into dirt), to find a picnic area and campsite on the right side of the road. Turn into the picnic area and follow a rough dirt road for a kilometre to arrive at a small turn-around area where there is a gated (in winter) 4WD road. Leave the car and follow the gated road for a few kilometres, crossing the creek via footbridges at various points. A well signposted track heads steeply up hill on the right. Walk up this, the Staircase Ridge, on the north-west side of the mountain. A hard two hours hiking will get you from 600m altitude to 1400m and the Bivouac Hut. Expect snow above 1000m. This hut can be a good base camp for the area. Another hour walk, through waist deep snow, will get you above the tree line and to the first snow pole. Follow the poles for a hundred metres or so then go up right and onto the top of the ridge. Camping on the ridge is the best place but can get mighty windy. Below is Pollux Outcrop (Map ref L 2.5) on the west side of the ridge. Descend one of the gullies below, preferably one of the smaller gullies on the summit end of the cliff. Most of the gullies on the northern end have steep sections of ice that make downward climbing with packs difficult. 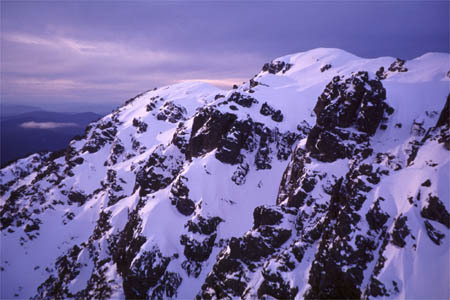 The northern end of the cliff has the longest and steepest climbing up solid, juggy volcanic rock with snow and occasional ice. The best ice is to be found deep inside the gullies, chimneys and cracks. Good, easy warm-ups are found on the more open southern end. There is a wealth of good mixed climbing in the area. The routes tend to be a couple of pitches in length and involve a whole swag of skills including free climbing, drytooling, ice climbing and aiding. Two short technical axes, rigid crampons, a few ice screws and a single rack of rock protection will get you up most routes. Pitons are useful but darn hard to hammer in when your wearing gloves, hanging off an axe wedged behind a loose block and looking at your last gear, a poor screw several metres below! The ice tends to be brittle and thin, rarely forming thick ‘waterfall’ style formations but instead coating the rock in a few centimetres of hard stuff. 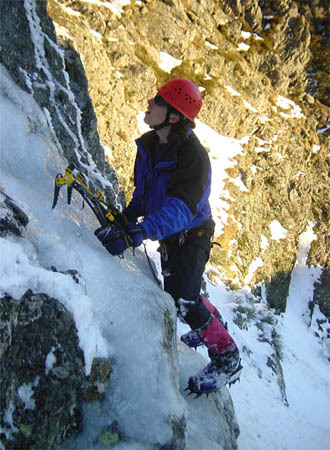 The ice also forms over the top of softer snow creating great steep climbing. We have never used snow stakes as the snow rarely gets deep or hard enough to get a solid placement. A single deadman would be useful as would double ropes. Because the area is shaded most of the day you need the full Gore-Tex ensemble and plenty of warm clothing. 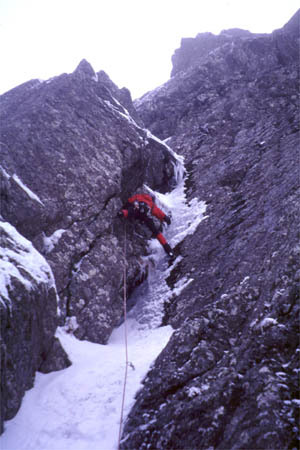 Above Right: Jono solos a short ice route below The Freak - 2001 season. The sun breaks the spell of the endless night. Sixteen hours spent in a cramped tent with another climbers toes in my face has been a far from pleasant experience. The roof of the tent is incrusted with icicles and bends down with the weight of freshly fallen snow. Still in our sleeping bags we make porridge and watch the constant spindrift roll down the rock above us and hiss over the small ledge that our tent is perched on. The previous day we had dug our home into an angled wall of snow under a small overhang. Now the tent seemed to be part of the mountain, its bright yellow hidden by the snow. The weather looked far from perfect outside. The view was one of clouds and white being buffeted by a light wind. It was, however, good conditions for our days planned activities - climbing a couple of new routes on the rock walls of Pollux Outcrop. The task of putting on gear was begun. The thermals, fleece, Gore-Tex and finally the plastic boots were shod in the little vestibule of the tent. Every time I tried to do up the frozen laces my hands go numb and the coordination disappears. Rubbing them together for a few minutes and the feeling comes back, creating another chance for more pain and numbness as I battle with the shoes. Finally we are both clothed and ready to climb. The first route of the day started just outside the tent. A blocky corner, coated with thin verbals and a freaky looking arm sized pillar of ice halfway up. Jono set in for the cold belay in the snow whilst I started up. My crampons scrapped against the rock, as I free climbed up to the first tongue of ice. I set my first ice tool, pulled up and reached for the pillar of ice. Placing a sling around the delicate shape meant I had some form of protection for the next difficult section. Some chimneying got me to a blank rock slab only a few moves from a good snow ramp. I checked my last piece of gear, a cam wedged in a brittle crack a few metres below. It looked good so I committed to the slab, edging up on the steel blade of my crampons. A few desperate drytooling moves and I reached safe ground and the snow slope above. The next pitch dealt with an iced up corner that we climbed on the right wall. 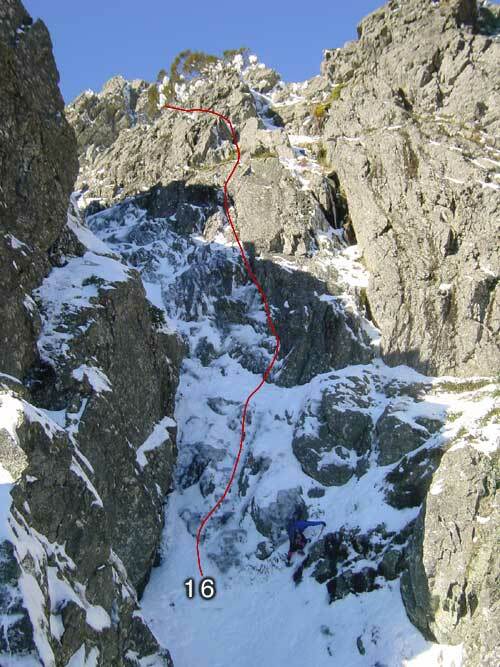 The extra reach from an ice axe got over the blank crux near the top better than any dyno could. The last pitch climbed a dark chimney then stepped out onto a small rock Pinnacle with massive exposure below. We named our line Finger of Fate, which described the gear on the first pitch and the desperate drytooling on edges of the second pitch. We descended the large gully to the right and spotted another good line on the steep right wall. A nicely cracked corner led to a bulge of dripping ice. I led up, scraping away a lot of the ice as I climbed. The crack accepted solid wires as well as my pick. I bridged up to a stance under the bulge and tried to survey the area ahead. 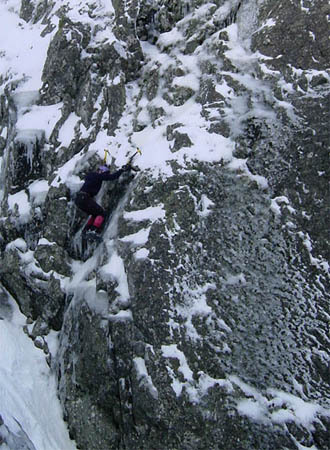 Chipping ice from an undercut crack revealed a good cam placement which gave me confidence for the crux moves ahead. Camming one axe upside down in the undercling, and then bridging with my feet I could just reach the next bit of ice. The pick sunk home in solid sounding stuff so I committed to the one arm swing, cutting loose and clawing my other pick higher. I was freaking out at this point, hardly trusting the bond of ice and rock that my pick was relying on. Dragging my feet behind I surmounted the bulge and finished up a few metres of solid ice to a belay on a small ledge. Jono followed, leading through up a short broken section of rock to belay in a large cave high up the cliff. The next pitch was another committing step across an exposed chasm which led to a fine ice gully and the top. Another alpine mixed route at been done, this one we named The Freak. In the fading light we dismantled the tent, shouldered the packs and soloed out another unexplored snow gully glistening with potential lines. The scope for further climbs of ever harder difficulty seems good. In five days of exploring we feel we still have not seen every wall, let alone climbed every route. For those interested in building mountaineering skills for overseas expeditions, I can think of no where better to train in Victoria. For those who want a different sort of challenge to the sun soaked rockclimbing of Arapiles, Mt Bogong offers a wealth of hard, cold, remote and technical climbing. I hope to see some others giving this place a go over the coming winters. This is our own system. Currently the hardest route, Ultra Magnetic, has moves similar to a grade 18 rockclimb. Routes up to about grade 5, should be easy enough to solo with a good set of crampons and two axes. Above Right: Marty on Slippery Slide - 2001 season. 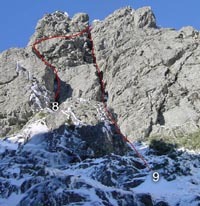 Above Left: Topo of "The Freak" 80m 10. Above Middle: Neil soloing the first ascent of Chilled Inflexion - 2001 season. Above Right: Neil on the FFA of The Freak - 2000 season. 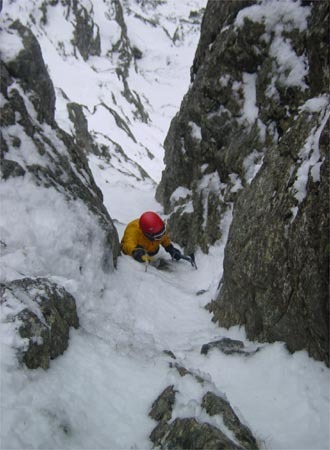 A good three pitches of technical climbing interspersed by snow ramps. 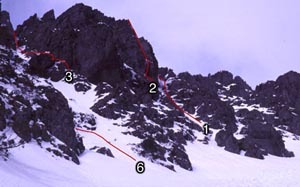 About 80m left of Big Gully is a wall with a blocky corner in it. 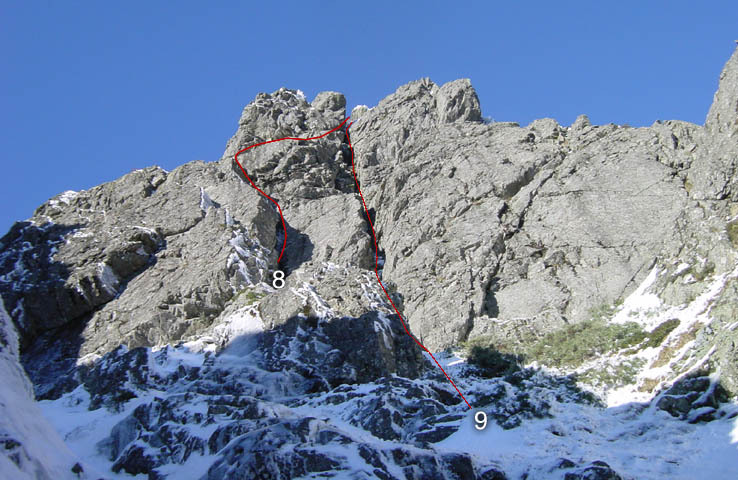 Pitch 1 - Large icicles hang down in various places marking the route. Up an ice covered slab to large finger of ice. Sling this and pick upwards on suss ice to small stance. Dry tool above this to tree. After slinging this plod up a snow ramp to ledge. Pitch 2 — Walk 20m right to below very obvious 90-degree right facing rock corner. Dry tool up this with limited protection. Walk up snow ramp to below large rock buttress. 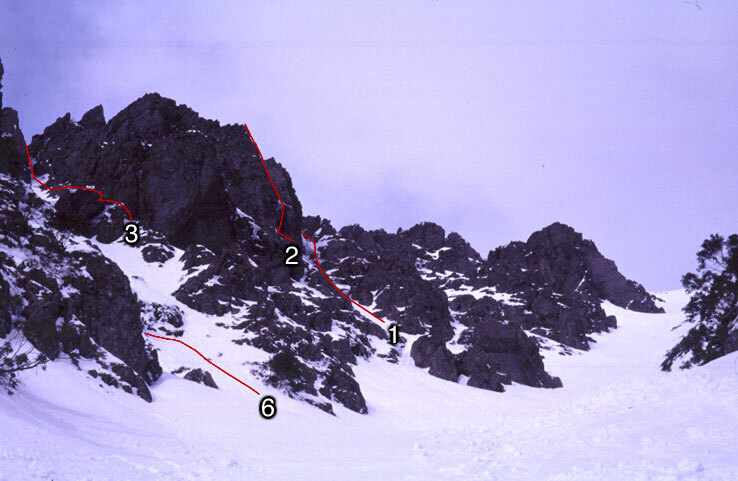 Pitch 3 — Climb easy snow and rock on exposed ridge on right side of buttress to summit. Pollux Outcrop Ice - From Neil's web site.